I’m a contributing photographer in a pop-up exhibition of photographs organized by yoga instructor Lisa Savage-Katz, focused on embracing who you are and your body, in all conditions and shapes and sizes, and loving yourself. I will have four images in the show, which feature Liza doing yoga poses in various and often surprising locations. A portion of the sale of prints goes toward community projects: Sale of my prints will benefit The Friends Project and our Masai scholarship project. I will be at the opening. 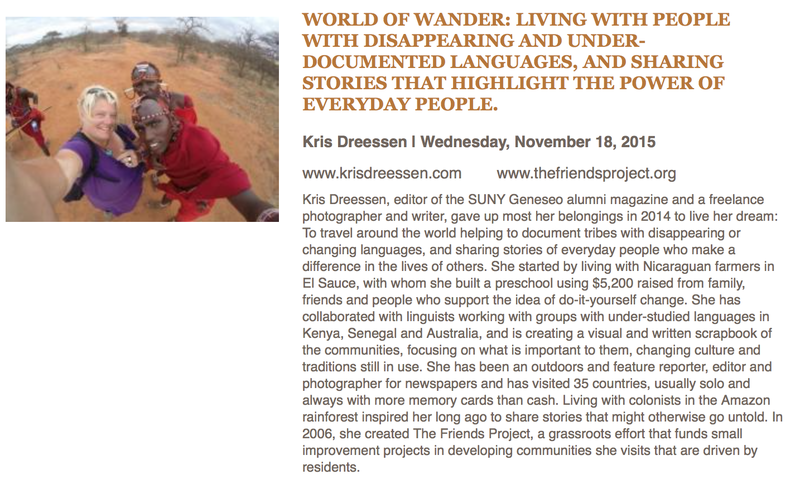 Kris Dreessen gave up most her belongings in 2014 to live her dream: To travel around the world helping to document tribes with disappearing or changing languages, and sharing stories of everyday people who make a difference in the lives of others. She started by living with Nicaraguan farmers in El Sauce, with whom she built a preschool using $5,200 raised from family, friends and people who support the idea of do-it-yourself change. She has collaborated with linguists working with groups with under-studied languages in Kenya, Senegal and Australia, and is creating a visual and written scrapbook of the communities, focusing on what is important to them, changing culture and traditions still in use. She has been an outdoors and feature reporter, editor and photographer for newspapers and has visited 35 countries, usually solo and always with more memory cards than cash. Living with colonists in the Amazon rainforest inspired her long ago to share stories that might otherwise go untold. In 2006, she created The Friends Project, a grassroots effort that funds small improvement projects in developing communities she visits that are driven by residents. ← My story about the school, in print!